Home to some of the most powerful and influential people in the history of Fogo, Bleak House represents the differences between the merchant class and the fishing class in the community from a century ago. Bleak House is an example of a 19th century merchant home that demonstrates the distinction between the merchant and fisher classes in rural Newfoundland and Labrador. The exact date that Bleak House was built is unknown, but it is suspected that the dwelling was built around 1816 for local merchant John Slade. The Slade family first became involved in the northern fishery around the middle of the eighteenth century. By the end of the century, they were the most powerful merchants in the Fogo Island fish trade, and their influence stretched into surrounding Notre Dame Bay. Sometime around the middle of the nineteenth century, John Owens, formerly Slade's bookkeeper, took over the house and the business. Owens managed to become wealthy after entering into an advantageous marriage. He operated a successful business on Fogo Island until he retired to England in 1897, when his house and businesses were bought by his partner, Henry Earle. The Earle family members were also influential merchants in the Fogo Island area. Running Earle Sons and Company Ltd., they operated a successful export and import business whose influence spread to other areas around Notre Dame and Bonavista Bays. In 1967 the family business was forced to close following the collapse of the Labrador fishery and the depletion of the Northern Cod stocks, and the Earles left the house. The Slades, Owens and Earles were among the most powerful and influential families in the history of Fogo, and the house reflects this. The house's name is said to be a reference to the 1853 Charles Dickens novel of the same name. Originally Bleak House was a rectangular, two-storeyed, centre-hall dwelling with a salt-box roof. Many of the features of the interior and exterior of the house were reflections of prevailing architectural designs of West County England. During the late 1800s additions were made to the house, especially in the rear. The location, appearance and size of the house indicate the importance of the families who lived there. Located on top of a hill, it overlooks the harbour and the rest of the community. It is located next to the business premises that used to be the heart of the Earle's commercial enterprises. In 1983 the house was made a gift to the Town Council of Fogo. It was already beginning to fall into disrepair after being abandoned for so many years. The town received funding to restore the house and transform it into a museum. It was made a Registered Heritage Structure in December 1985 by the Heritage Foundation of Newfoundland and Labrador, and became the first building in the province to be restored through the foundation's restoration program. The Bleak House Museum has been open to the general public since 1988, and remains one of the best examples of successful, long-term adaptive reuse. 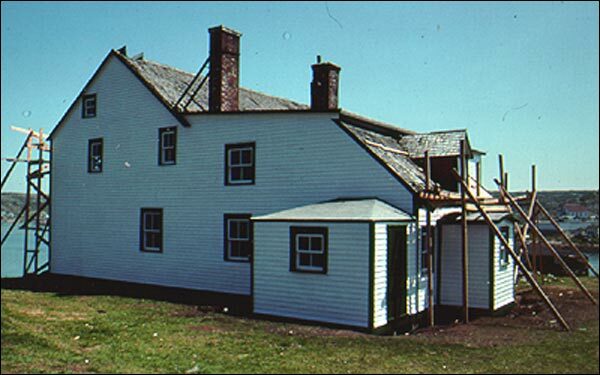 Also view the Bleak House Registered Heritage Structure, and the Bleak House Municipal Heritage Site on the Heritage Foundation of Newfoundland and Labrador web site. The Newfoundland and Labrador Heritage Web Site has on its site only a portion of the registered heritage structures in Newfoundland and Labrador. To view a complete list or search for a particular structure visit the Heritage Foundation's Property Search page.